Coventry At Heathrow is the latest neighborhood to be developed within the upscale guard-gated community of Heathrow Florida. 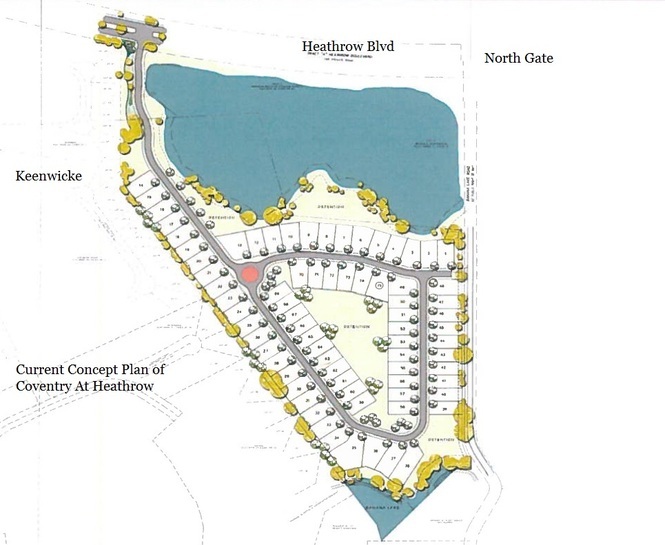 The neighborhood is being developed by Taylor Morrison Home Builders and is located just inside the north gate entry point across from Heron Ridge and adjacent to Keenwicke. Coventry At Heathrow’s entry point is just past the lake on the left as you enter Heathrow and just before the rear portion of Keenwicke. The neighborhood is wholly located within Heathrow and is now a part of the Heathrow Lakes Association which is overseen by the Heathrow Master Association. Coventry consists of 75 three, four and five bedroom homes with attached two and three car garages on lots ranging in width between 60 and 70 feet. Some of the homes will border an interior dry pond/lake and several have views of beautiful Banana Lake. Living area square footages will range between approximately 2,500 to 4,148 over 10 different floor plans from which to choose. Price points, elevations and floorplans have been released and the starting price point is $419,000 for the 2,500 sq foot model with additional options and upgrades available. Sales began in November of 2013. IF YOU WOULD LIKE MORE INFORMATION REGARDING COVENTRY AT HEATHROW OR ANY OTHER NEIGHBORHOOD – CONTACT US!